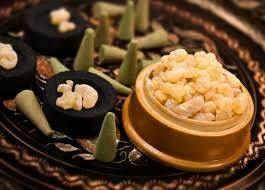 Frankincense-Myrrh: Deep, musky scent with warm overtones of Amber resin and Myrrh beauty. Nice scent; not too strong. Thanks for the extra goodie! Musky, sensual and earthy. Very nice. Although potent, the blend lacks an overwhelming characteristic, which I often note within frankincense-based scents.